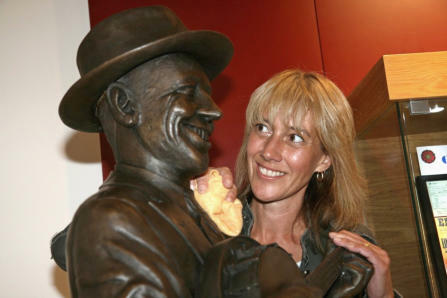 The Grand Arcade in Wigan was full of GFS personalities on the very special day of 7 September 2007 when Gerry Mawdsley realized his dream of having a statue of George Formby unveiled in his and George’s hometown of Wigan. In spite of much opposition from some of Wigan’s councillors but thanks in particular to one, Gareth Fairhurst, George finally made it to the unveiling party albeit not in the original place intended for one of Wigan’s most famous sons. Instead of being mounted on a plinth in the bright new Grand Arcade, George Formby is tucked away in one ignominious corner where many will surely miss even gazing on this noble work. Having said that, he is there for all to see (once they locate him) and that is an achievement in itself and I will be very surprised if George isn’t moved to a more suitable location before too long. This didn’t spoil the day though and there were enough press and TV people there to justify the claim that George Formby can still pull in a crowd. Many GFS members had brought their ukuleles with them and the Arcade rang out with all the old hits of the great man. Statue sculptress Amanda Barton was on hand along with Modus Properties representative Louise Pearson and Councillor Gareth Fairhurst along with Joe Brown, Neil Forshaw and Vivien Mawdsley (who all played their parts to achieve this goal) jointly pulled the string that unveiled the statue to rousing cheers of delight. Obviously many people wished to have their photos taken with the new statue and did so whilst the ukulele players celebrated with more impromptu performance out in the main thoroughfare of the Arcade (which is where George really should have been sited). From there we all progressed to the Britannia Hotel were a buffet for 250 people had been provided for by the GFS before a concert took place and carried on for the rest of the evening. Many members entertained on this historic occasion and were as usual ably backed by GFS musicians Matthew Richards and Chris Weightman on keyboard and Geoff Shone on drums. So now George Formby has a permanent position in his hometown of Wigan and alongside him is a very nice display of photographs and memorabilia put together by archivist Neil Forshaw. No matter what position George is situated in, he usually managed to win the day and I feel sure that the Wigan councillors who opposed the idea of a statue will eventually see the light of day and George will be moved to a better position for all to view him. For those who have worked and contributed to this successful campaign, the GFS should be especially grateful. People as well as companies and show business celebrities have given hard earned cash to make all this possible. In particular though, as well as being George Formby’s day, it should also be regarded as Gerry Mawdsley’s day. He has worked tirelessly to get the job done and in spite of all the opposition, he came through a winner – just like the man cast in bronze. Turned Out Nice Again! Statue is relocated The date is confirmed at Saturday 23 May 2009 at 14:00. To celebrate George Formby’s 105th Birthday Anniversary, the team at Grand Arcade, Wigan will be relocating the commemorative statue to a more popular and visible area within the centre. This gives all visitors and the community of Wigan a chance to further enjoy the Wigan legend. The move will coincide with George’s birthday on 26th May 2009, with an envisaged move date of Saturday 23rd May. The current location of the statue is in Grand Arcade’s New Lanes, by the Millgate entrance from Concert Square. It will be moved to the central area adjacent to the Grand Arcade Customer Service Desk. Also a brand new commemorative plaque will be placed next to the new location. 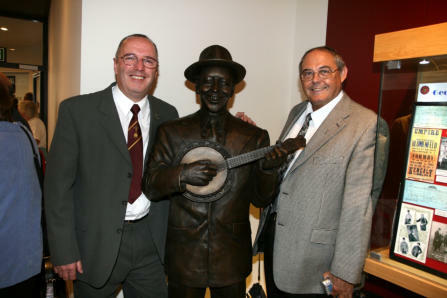 The bronzed statue of George Formby was placed in its present area of Grand Arcade during the centre’s opening year of 2007. In conjunction with the move of the George Formby statue, Grand Arcade are launching a competition to invite the community of Wigan to design and send George birthday cards for his 105th birthday. The best cards will be displayed by the statue during his birthday period and a winning prize will be on offer. For more information, please contact: Janet Monks, PR Manager Shoppertainment George Formby born in Westminster St, Wigan in 1904, entertained an estimated THREE MILLION Allied Servicemen and women during World War II throughout Europe and the Middle East. During his career he made 22 films and over 350 records he was also quite popular in Canada, Australia, New Zealand and South Africa. George Formby was quite literally the legend of Wigan. 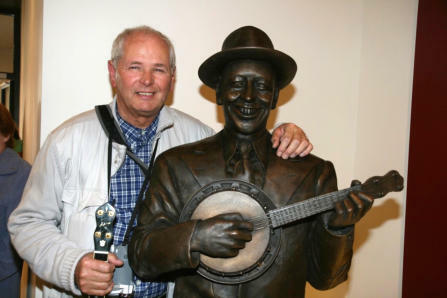 It has long been spoken of but nobody really thought it would ever become a reality – a statue of George Formby in his home town of Wigan. The man behind this finally successful bid is the new President of the George Formby Society, Gerry Mawdsley who has been campaigning for many years to get GF the recognition he has for so long deserved. A statue already exists in the Isle of Man were George made one of his most famous films, “No Limit” and that statue depicts him in his racing leathers. With the help of councillors serving the borough of Wigan and the funds of the George Formby Society together with assistance from various other sources £30,000 of the final total of £35,000 has been raised and with money still coming in from various appeals it looks as if next year will be a momentous year both for the George Formby Society and for the town of Wigan who thankfully have not forgotten one of their most famous residents. The idea really took of when Gerry contacted Modus Properties who were about to build a new shopping centre in Wigan. After much emailing between Gerry and Modus director Tim Heatley the news came that Modus would “do something” to preserve the Formby/Wigan link in the new mall. The Isle of Man statue was created by Amanda Barton so it seemed logical that she should be asked to create the Wigan model. Amanda and Wigan councillor Gareth Fairhurst came to Blackpool to meet the members of the GFS committee and after lengthy discussions and much studying of photographs of GF the idea took flight. Statue is relocated The date is confirmed at Saturday 23 May 2009 at 14:00. To celebrate George Formby’s 105th Birthday Anniversary, the team at Grand Arcade, Wigan will be relocating the commemorative statue to a more popular and visible area within the centre. This gives all visitors and the community of Wigan a chance to further enjoy the Wigan legend. The move will coincide with George’s birthday on 26th May 2009, with an envisaged move date of Saturday 23rd May. The current location of the statue is in Grand Arcade’s New Lanes, by the Millgate entrance from Concert Square. It will be moved to the central area adjacent to the Grand Arcade Customer Service Desk. Also a brand new commemorative plaque will be placed next to the new location. The bronzed statue of George Formby was placed in its present area of Grand Arcade during the centre’s opening year of 2007. John Sanson, Grand Arcade Centre Manager said, ‘As a lifelong George Formby fan, I am delighted to be making this announcement in regards to the move of the commemorative statue on George’s birthday – it’ll be a celebration for the community of Grand Arcade and George Formby fans alike.’ Gerry Mawdsley, the Wigan born President of the George Formby Society said, ‘ George has been in a few tight spots during his film career, at the end he always managed to win the day. It looks like he has come out on top again, thanks to John Sanson and his colleagues at Grand Arcade and Modus. When we asked Modus in 2008 if there was a chance of moving him, we were delighted when they agreed. I am sure lots of people in Wigan will applaud this wonderful news.’ In conjunction with the move of the George Formby statue, Grand Arcade are launching a competition to invite the community of Wigan to design and send George birthday cards for his 105th birthday. The best cards will be displayed by the statue during his birthday period and a winning prize will be on offer. For more information, please contact: Janet Monks, PR Manager Shoppertainment George Formby born in Westminster St, Wigan in 1904, entertained an estimated THREE MILLION Allied Servicemen and women during World War II throughout Europe and the Middle East. During his career he made 22 films and over 350 records he was also quite popular in Canada, Australia, New Zealand and South Africa. George Formby was quite literally the legend of Wigan.